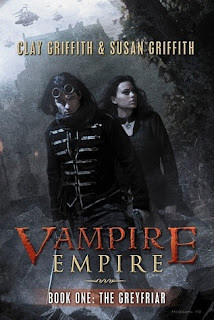 Today I received a copy of The Greyfriar (Vampire Empire #1) for review! Isn't it funny how the mere mention of a book, can make it pop-up all over the place? Check out this great review of The Greyfriar written by Melissa at i swim for oceans! Vampire predators run wild in this exciting steampunk adventure, the first in an alternate history trilogy that is already attracting attention. In 1870, monsters rise up and conquer the northern lands, As great cities are swallowed up by carnage and disease, landowners and other elite flee south to escape their blood-thirsty wrath. One hundred fifty years later, the great divide still exists; fangs on one side of the border, worried defenders on the other. This fragile equilibrium is threatened, then crumbles after a single young princess becomes almost hopelessly lost in the hostile territory. At first, she has only one defender: a mysterious Greyfriar who roams freely in dangerous vampire regions. Tuesday Review Day! I Am Number Four! Plus Movie Trailer! Over the last 65 years Boccarossa Insurance has grown from a local insurance agency to one of the most well respected agencies in the county. How? By helping customers protect what’s most important to them and providing outstanding customer service. Lots of insurance companies can give you a quote. We back it up with superior service. Come into our office today to see how we can help you! Elaine has read 14 books toward her goal of 28 books. "...It's Like a Whirlwind Inside of my Head..."
Are You A Caster Girl?